Etsy wants the world to know how much its makers have to offer the world this holiday season, debuting a new “Made with love” campaign that showcases the site’s quirky individuality and outside-the-gift-box creativity. Testimonial TV spots from Sandwich Video highlight everything from hand-made personalized jewelry to dog portraits to life-size living room rulers, emphasizing how Etsy offers the chance to find unique items that are a perfect match for someone’s personality. 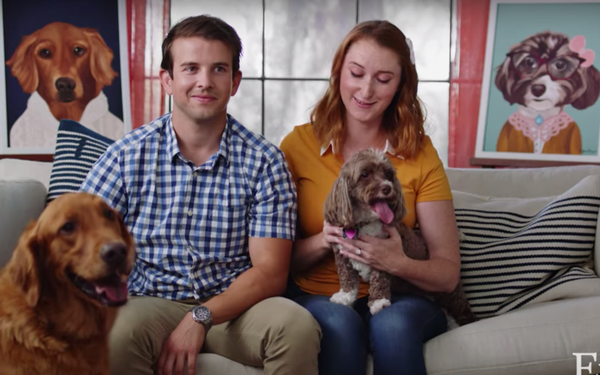 Ads are scheduled to run nationally for four weeks, beginning this week, in both 30 and 15-second versions. The company is also running illustrations in 575 New York City subway cars, showcasing Etsy’s breadth. The online retailer is reprising last year’s partnership with American Express and Small Business Saturday, with Etsy sellers hosting pop-up markets in San Francisco, Austin, Washington D.C. and Boston. New this year, it’s teaming up with Brit + Co, offering an Etsy shop with 1,000 curated items, which will use a special shopping tool to steer Brit fans to Etsy items. Etsy also says it’s improved its search and discovery function, is continuing to encourage its 2 million sellers to improve shipping offers — and notes that millions of items now ship free. The Brooklyn-based Etsy just released its latest quarterly financial reports, surprising investors with better-than-expected numbers. Its measure of gross sales rose 20.4% to $922.5 million, up from $766.3 million in the same period a year ago. And revenue climbed 41% to $150.3 million, from $106.4 million in the year-ago period. Net income declined to $19.8 million, from $25.8 million.